“This world’s divided into two kinds of people: the hunter and the hunted. Luckily I’m the hunter. Nothing can change that.” Based on a famous short story of the same name (also published as The Hounds of Zaroff) by author Richard Connell that appeared in a 1924 issues of Collier’s Weekly, The Most Dangerous Game concerns a big game hunter named “Bob Rainesford” (Joel McCrea) who survives a shipwreck and swims to an island where he is hunted by the insane “Count Zaroff” (Leslie Banks). The island includes other survivors from an earlier shipwreck – “Eve” (Fay Wray) and her brother “Martin” (Robert Armstrong). Beware: Something gruesome lurks in the Count’s “Trophy Room.” Evil henchman “Ivan” (Noble Johnson), “Tartar” (Steve Clemente) and “Captain” (William B. Davidson) round out the cast. With a running time of just 63 minutes, The Most Dangerous Game cuts to the chase quickly and features a thrilling struggle for survival in the jungle. 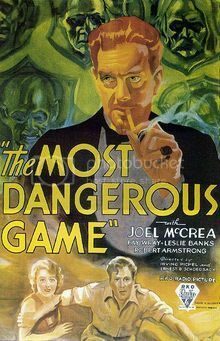 Directed by Ernest B. Schoedsack and Irving Pichel, The Most Dangerous Game was filmed on the same sets used for the “Skull Island” scenes in King Kong (1933) and utilized some of the same cast, including Wray, Armstrong and Clemente. Useless Trivia: The film was remade in 1945 as A Game of Death and in 1956 as Run for the Sun.